In September of last year, we issued the most ominous warning in the 46 years since I first founded my research company. We predicted a Great Convergence of historic cycles unlike any since the 1930s — a powerful tidal wave destined to transform the financial world as we know it. That convergence started right on schedule late last year. We warned that the first impact would be on the sovereign bonds of the world’s largest, most indebted nations. 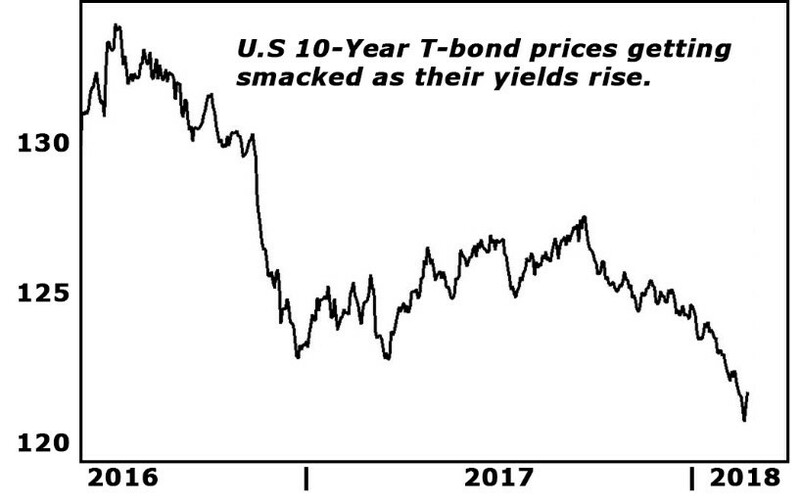 In fact, as you can see in the chart, 10-year U.S. Treasury-bond prices began falling in 2016 … then stabilized for most of 2017 … and now, with the Great Convergence, have tumbled to new lows for this cycle. That’s the fundamental force we were talking about in every webinar, report and flash alert. That’s the force that barreled into the stock market this week. And it’s what investors should be paying closest attention to going forward for two reasons: It can hurt key stock sectors! But, to the degree that inflation fears are the cause, and it can be a great boon for commodities and commodity stocks! Reduce exposure to the most vulnerable sectors (like banks). Beef up their stakes in the sectors that benefit the most from inflation (like commodity stocks). Diversify beyond stocks and bonds to investments that are not correlated with the Dow Jones Industrial Average (like bullion). Falling bonds and rising interest rates are big. Never underestimate their power and durability. You got a taste of it this week. On Monday, after falling steadily throughout the afternoon, the Dow plunged an additional 800-plus points in a matter of minutes, only to regain a large chunk of that shortly thereafter. But even after the dust settled, the Dow was still down 1,175 points, the biggest point decline ever. No, it was not the worst plunge in percentage terms. Far from it. Still, combine Monday’s drop with the Dow’s 666-point drop last Friday, and it starts adding up to real money. In fact, this is now officially the worst correction since August 2011, and everyone is struggling to understand what the catalyst might have been. I repeat: It’s not some random news event like last Friday’s bullish employment report. Nor can you write it off to a bunch of computers spitting out automatic trades. As I said, it’s all about the convergence of cycles and decline in bond prices (rise in yields). Want more evidence that something big is happening? Then look at the gigantic surge in volatility that accompanied the move this week. The CBOE Volatility Index was dormant for several months, hovering around record lows below 10. But in recent trading, it exploded higher — hitting as much as 50. That’s a level we’ve only seen once since the financial crisis. It was in August 2015 when China sparked a major market sell-off by adjusting its currency policy. One specialized investment designed to rise in value when volatility declines is the VelocityShares Daily Inverse VIX Short-Term ETN (Nasdaq: XIV). It dropped more than 14% in Monday’s regular session. No one can know with certainty what the future will bring. That’s why all Money and Markets editors watch the markets like a hawk. But anyone who has followed us in recent years knows one thing for sure: We are not shy. Whenever it comes time to take action, we let you know immediately. And when it comes time to shout from the rooftops, we will do that too. That’s what we did again in mid-2005 when we saw the housing bubble beginning to burst. It’s also what our Weiss Ratings group is doing right now regarding all stocks, exchange-traded funds and mutual funds that merit a Weiss Investment Rating of D+ or lower. So stand by for our updates!